KCAL9HD LIVE Sky9 video of a police pursuit with suspects throwing money out of a black Volvo SUV on Wednesday, September 12, 2012 (elapsed time 10:25). A 70-minute Los Angeles County Sheriff’s Department police chase started after a robbery call at 10:08 a.m.Wednesday, September 12, 2012 at a Bank of America branch on Soledad Canyon Road in Santa Clarita. The robbery was reported to be a “takeover style” armed robbery. Sheriff’s deputies followed a black Volvo SUV down the 210 freeway and into the San Fernando Valley. Two vehicle occupants bailed out in Sylmar, then the SUV headed toward downtown Los Angeles. One of those vehicle occupants was captured at Yarnell Street and Foothill Boulevard. The other was still at large Wednesday. Robbers throw money out of their black Volvo as they flee police. 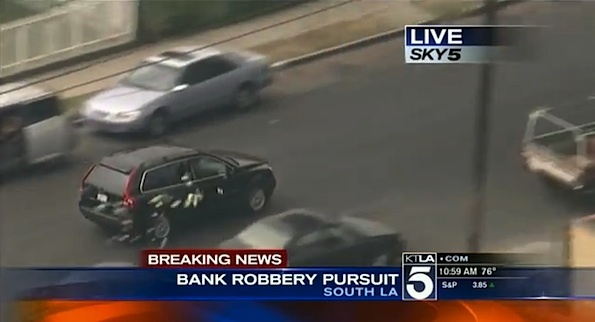 During the chase the suspects started throwing money out the windows of the vehicle. Crowds rushed toward the chase. Some were yelling at the Volvo and some were trying to pickup money. The crowds and traffic eventually forced the offending vehicle to stop just south of the Los Angeles Memorial Coliseum at near Vernon Avenue and Vermont Avenue about 11:20 a.m. Two men were arrested without any further resistance. No serious injuries occurred, but during the chase, an LAPD officer’s foot was run over by a car and a civilian reported he was hit by an LAPD police car or county sheriff’s police cruiser. The FBI ranks Santa Clarita, California as the sixth safest city in the United States with at least 100,000 inhabitants. The city is served by the Los Angeles County Sheriff’s Department. In summary, three suspects captured, and one at large.